This post probably isn’t “seasonally appropriate” for my blog. I suppose Bacon Wrapped BBQ Meatloaf doesn’t scream “Spring” like asparagus or strawberries or a fresh squeeze of lemon*, but I decided to go rogue on this one because I believe anything bacon-wrapped transcends seasonality. Besides, barbecue sauce reminds you of Spring and Summer, right? Whatever, like I said, I’m going rogue. Join me. I love meatloaf (especially with a side of mashed potatoes) and when I saw a recipe for this one wrapped up in a layer of bacon and then smothered in barbecue sauce I knew I had to make it. I lightened up the loaf using ground turkey, lean ground beef and turkey bacon. It turned out super flavorful and I loved the bacon-BBQ coating. It’s also a Weight Watchers or calorie-counting steal at only 6 SmartPoints or 238 calories for two slices! I served mine with ½ cup of mashed potatoes and some broccoli for a very satisfying and tasty meal. *The next recipe I have planned has Spring written all over it, so sticklers, fear not! Pre-heat the oven to 350. Line a baking sheet with aluminum foil and set aside. In a large bowl, combine the beef and turkey and mush together with clean hands until combined. Add the onion, 3 tablespoons of the barbecue sauce, mustard, chili powder, garlic powder, salt, pepper, saltine crumbs and egg and lightly mix together. Do not over handle. Transfer the meat mixture to the lined baking sheet and form into a 9” x 5” loaf. Lay the strips of bacon in a row to cover the top of the meatloaf, each one slightly overlapping the piece before it. Tuck the ends of the bacon strips underneath the bottom of the meatloaf. Using a silicone pastry brush, brush the remaining 2 tablespoons of barbecue sauce over the entire loaf. Bake in the oven for 50-60 minutes or until your meat thermometer reads 160 degrees. Cut into 12 even slices and serve. In my opinion it’s always meatloaf season! can’t wait to try this one! Maybe because I haven’t yet put my snow shovel away (I used it last week…) I think it is perfect weather for meatloaf! I made a modified version over the weekend; yum! Check out http://www.skinnytaste.com – she has a great recipe for skinny garlic mashed potatoes that are a 3/4c serving size. We’ve tried a bunch of your recipes now, Emily, and this one is our favorite so far! My fiance is a meatloaf-lover and he said this is one of the best he’s had. Thank you for all the awesome recipes and meal ideas!! 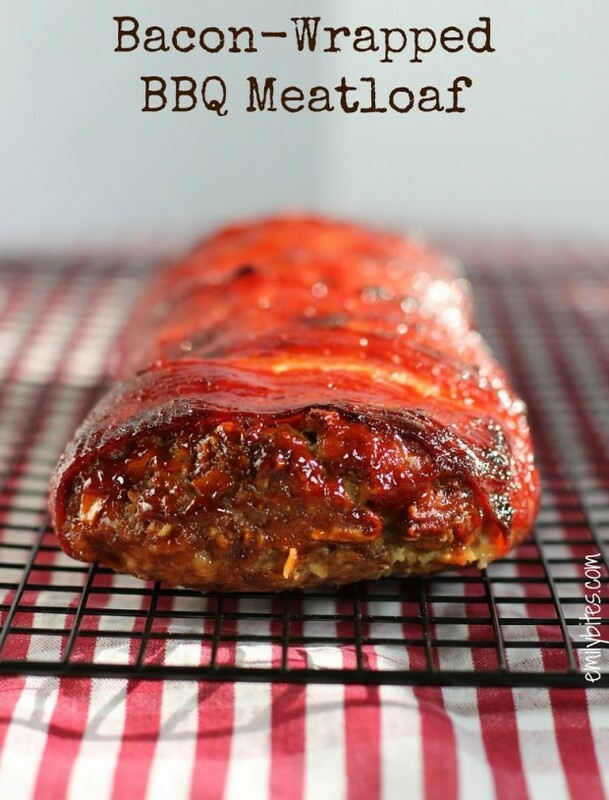 I’ve only seen a few meatloaf recipes that include rapped bacon but it sure adds some delicious flavor to the meal. Also, I’ve found that sprinkling shredded cheese, like mozzarella or cheddar, before applying the bacon is a good trick. A healthier cheese option will retain the essence of this being a lower calorie recipe. Thanks for sharing! Thanks you Emily…My family and I have loved every recipe that I have made from your website! Emily, I made this a couple of weeks ago – a total yum!! I immediately posted it on pinterest and have been getting repins ever since. In fact this recipe/post has gotten more repins than anything I’ve ever posted. Of course you have the credit!! Thank you for this wonderful recipe!!! I’m so glad you made a meatloaf without ketchup. Can’t wait to try this. I made this meatloaf just like this, and it is awesome! My 15 yr old daughter who loves meatloaf thought it was wonderful! Thank You Emily! Would it change the point plus value to use Oscar Meyer Center cut Bacon? Made this for dinner on Saturday night and my boyfriend and I loved it. Fantastic the next day for meatloaf sandwiches! I’ve been trying your recipes periodically over the last few months, and, I have to say, they are amazing. 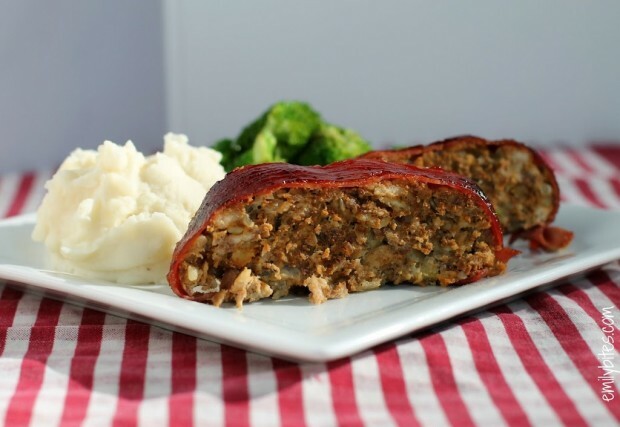 Some of my favorites are the bacon cheeseburger wraps, french dip cupcakes, and this meatloaf (my husband and I rank new recipes I try from 1-5 stars. My husband took 1 bite and said, “oh my gosh. 5 stars”). Thank you thank you for this wonderful website! It’s so refreshing to make low calorie recipes that my husband actually enjoys. I am a new blogger and am starting to publish my Menus for the week. This recipe is on the list and we can’t wait to try it out! I would love if you would stop by and check it out sometime! Bacon and meatloaf?!? YUM!!!! This was so good and simple to make! Thank you! Made this tonight 🙂 YUMMO!!!! Definitely making its way into our meal rotation!!! This has become a much requested recipe! Yummy! This looks awesome, my husband who doesn’t like meatloaf may even enjoy it. But I am confused, in your posting you say it is 6 points for 2 slices, but in the nutritional info it says 8, so which one is it? Oops, it’s 6…I must have copied it wrong when I reformatted the post. I can’t fix it until I’m at my computer (I’m on my phone now) but I will tonight. Thanks for the heads up and sorry for the confusion! Could I use store bought breadcrumbs instead of the crackers? How much would I use? I did 6 servings in the recipe builder and it’s 8 freestyle points not 5 for two slices. When I did 12 servings and then 2 slices it’s 4 points.